We'll show you the grandeur of the Pacific Ocean and the playfulness of the otters in Hunter Creek. Observe eagles, egrets, and graceful cranes at play from the window of your RV or cottage, soothed by the sound of the nearby surf. Winter is dramatic yet tranquil as storms and rainbows collide and tides roll in and out. Comes with a living room with, private queen bedroom, couch, large TV, kitchen, and more! Enjoy the best of both worlds, ocean or hillside view. FHU site with water, electric wifi and more! The only in-area RV park with a Jacuzzi! Our sites come with a grill and picnic table. 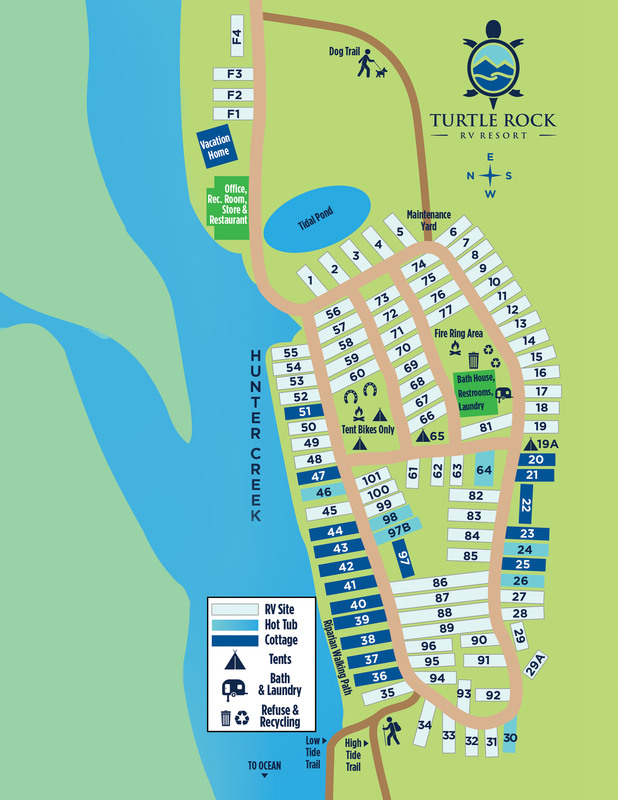 Turtle Rock RV Resort is located just off Highway 101 at the south end of sunny Gold Beach on the spectacular southern Oregon Coast. With over 100 RV and tent sites featuring pull-thru's and back-ins, cottage rentals/sales and more, we have the finest full accommodations on the southern Oregon Coast. 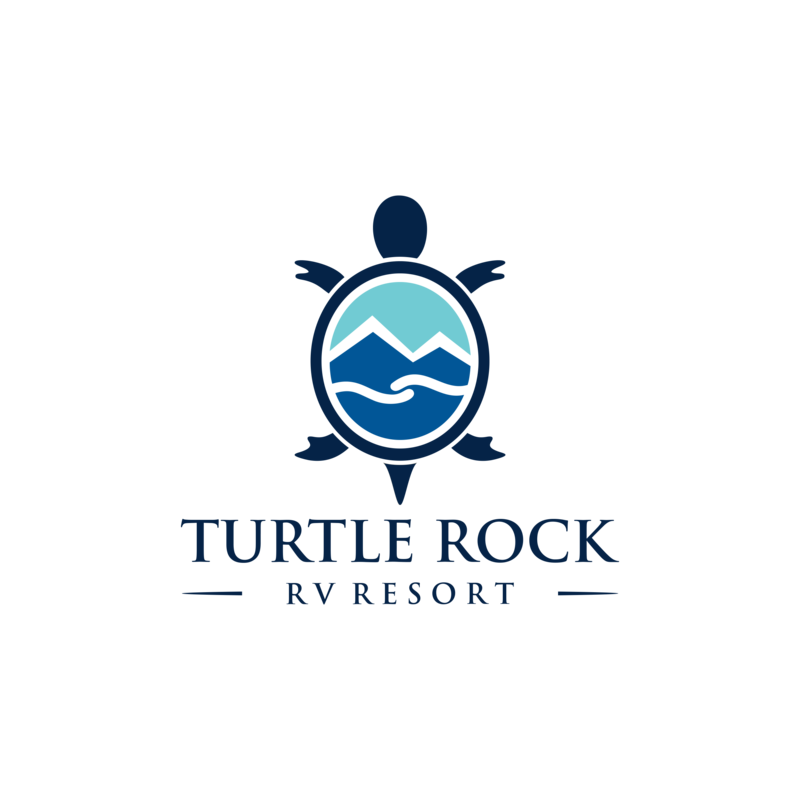 Experience Turtle Rock RV Resort, situated on 24 acres on the Pacific. -	Our group venue, perfect for reunions, weddings, meetings, and more. Guests are invited to join our Easter Egg Hunt on April 21 - 4pm. Keep your eyes on the prize. Explore the grounds at Turtle Rock Resort find the egg that makes you a lucky winner.  Turtle Rock is giving away merchandise, gift certificates, and free nights in the park so hunt well on April 21st. For more details ask a member of our staff. Eggciting prizes await! Bring your basket. Open for kids and adults. My mom, boyfriend, dog and I traveled 15 hours to the Oregon coast from Salt Lake City, UT and were relieved at the sight - and by the hospitality of Turtle Rock. We celebrated my 30th birthday by exploring the lighthouse at Cape Blanco. We took scenic photos at Cape Sebastian and relaxed in our cottage. We visited Frances Schrader forest and were humbled by the wildness and stillness of the tress. We enjoyed the Port of Brookings Harbor. Most of all, we enjoyed Otter Point. My niece from New Jersey and my nephew from Paradise, CA, and I stayed in your cottage while the rest of his family stayed in their RVs. We celebrated his 38th birthday. Cottage is beautiful and the area is scenic with lots to do. We walked the beach, surf fished and went on a very successful deep sea fishing trip out of Brookings. Hope to return another time! Thank you for sharing your beautiful cottage with us! We loved the hot tub; it did wonders for my disabled son. Turtle Rock Resorts, we thank you for your making us feel like we are at home while we are there. We have never been disappointed in the 3 years we have stayed with you. A nice, well-maintained park with various length pull thru sites as well as back in sites. My site, #69, was long enough for my 40' Class A towing an 18' car hauler trailer and remain connected. I had to pull all the way to the front of the site which required me to block my wheels in anticipation of a wheel being elevated because the site slanted to the PS. It was my preference to not have the wheels elevated so that's why I maintained a high review and did not deduct any satisfaction value in my rating. Bathrooms and showers are available but we did not use, even though tubs are available. My wife has been wanting to take a bath since we started FT!! A short walk to the beach from the park to see the Turtle Rock!! Easy to navigate interior roadways. Sites are FHU with 30A/50A and cable. WiFi is also provided although weak but not unlike other parks I have visited. Passport America discounts makes this park a top-of-the-list park for me. Office staff are very welcoming and friendly. Office has a few camping essentials and snacks. A DVD movie cabinet is in the office for campers to view and return. Sites are gravelled with a grass patio area. We are fairly close to our neighbor but not intrusive. I will camp here again when in the area. We booked space number 64 with a private hot tub and deck and we love it! The temps here in August are 60's and low 70's with cool ocean breezes so being in the hot tub is glorious! The park is quiet and folks are friendly. We also enjoy the micro brew and bar/restaurant across the street from the park. The trail to the beach is great, but bundle up if taking a walk on the beach; it's very windy and chilly, but truly magnificent visually. We will be back! Amazing place, I can't wait to go back. We rented cabin #23 for 3 days as part of a road trip we took to celebrate our wedding anniversary. We had a private hot tub. It is walking distance to the ocean. Also walking distance to Arch Rock Brewing (stop by there). It was a quiet, clean park. Perfect to rent cabin, or bring the RV...some RV spots have small decks with private hot tubs. So have beautiful water views. There are restrooms/showers centrally located ( did not use, just saw them). Family friendly, or perfect for a romantic getaway! Close to town, but not too close. We couldn't have asked for better service or more friendly people. And to add to the pleasure of staying here, this is the most dog friendly park We have ever seen. Sites are level but not paved. There are trees which provide plenty of shade and only a short walk to the beach. We will be returning for another stay. Great play to stay in Gold Beach. It's just a short walk to the ocean and a short drive into town. Very relaxing and quiet campground. We'd definitely stay here again. We had a lovely time. The facility is very clean & well maintained. Washers and dryers worked well & are reasonably priced. Right on the water, we loved hearing the roaring waves in the dark as we soaked in our own hot tub on the deck. Friendly staff, and we would come back! It's a great quite park. We were only a 5 minute walk to the beach. The staff was great to deal with. We arrived after normal business hours but they had us all checked in already. They had a map lined out for us to our spot. Loved the restaurant tortuga, the cleanliness of the campground, so convenient and easy to find. My wife and I have stayed with you three times now and every stay has been better than the last, I am not a hot tub person but I have to say that when I come back from the beach and climb into that nice clean hot water all my misgivings about hot tubs wash away, we love your place and will be back again and again Thank You for making my stays so comfortable. We were very surprised to find such a clean, dog friendly almost ocean front spot. The hot tub on site was an extra added bonus after many days on the road. The staff were extremely accommodating and the whole experience confirms our attitude towards all of Oregon's effort to make a tourist feel the pride their state has to offer to everyone that visits!